Immerse yourself in the historic charm of The Walper Hotel. This iconic 1893 landmark is the epicentre of one of Kitchener, Ontario’s oldest neighbourhoods, now a hub of vibrant growth, partly due to the buzzing tech scene of the Waterloo-Toronto Tech Corridor. Journey along King & Queen streets to explore dozens of independent, locally-owned shops, including coffee bistros, restaurants & pubs, art galleries & museums or venture just steps from the hotel to Kitchener-Waterloo's urban nature getaway, Victoria Park. You’ll be captivated by this Kitchener-Waterloo hotel's amazing past, and charmed by its contemporary flare. From Eleanor Roosevelt’s preferred breakfast location on the interior terrace to Lennox Lewis’ boxing match in the Crystal Ballroom, every nook and cranny in this Kitchener-Waterloo hotel has a story to tell. And now, we’d like you to be our next guest. Whether you're looking to tie the knot, host a corporate event, or have a drink at our 2nd floor cocktail lounge, The Walper Hotel in Kitchener-Waterloo has everything you need. Plan your corporate meeting in our newly renovated 2nd floor event space featuring the latest in Audio-Visual needs, or stay over on one of our 3 floors of beautiful boutique hotel rooms! Staying in the only boutique hotel in Waterloo Region means your experience will be a unique one, catered to your wants & whims. 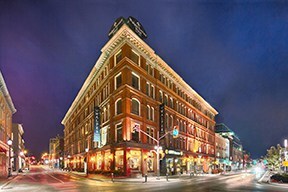 We truly are unlike other Kitchener-Waterloo Hotels! We've hosted downtown Kitchener weddings since 1893; from traditional ceremonies to modern day chic - we create, and you celebrate! Let us take you on a site tour of our Kitchener-Waterloo wedding venue and enjoy a complimentary tasting at TWH Social after. GUEST ROOMS NOW FULLY OPEN! Each room comes stocked with just enough heritage, quirk and charm coupled with lovely modern amenities to ensure your comfort! Our hotel rooms are fitted with the finest of furnishings, custom wallpaper, oodles of natural light and loads of tech friendly options for the sophisticated traveller. We aimed for the perfect balance of timeless glamour and contemporary comfort, and we’re sure you’ll agree that we have succeeded. Boxed Water. It's just better. No two hotel rooms are exactly alike at The Walper Hotel. The variety of our Kitchener accommodation sizes and shapes allows our staff to select the hotel room that will best match your needs.